In this tutorial we will make a HUD capable of displaying messages with some nice effect like changing color and fading out. The best way to do animations from blueprints is to use timelines. But, as we know, Timeline is a so-called latent node and it has some limitations. For example, it can't be used inside functions and it breaks Event Receive Draw HUD. In this tutorial I deal with this problem. The basic idea is to have a separate event that hosts the timeline for our visual effect and talks to the Draw HUD event via local variables. 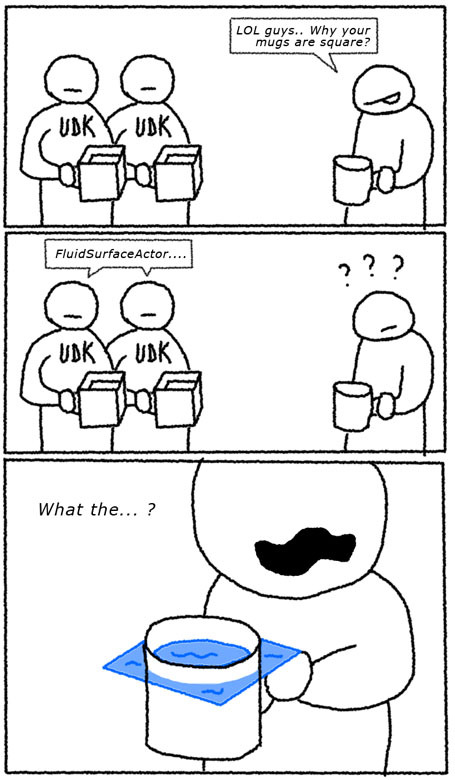 For the last few weeks I've been studying Unreal Development Kit (UDK). The engine is great, and the editor is relatively simple. However, it has certain drawbacks as well, small things really. But it is funny how small things can get you raging. Just one of these, for example, is that when you want to make an interactive liquid, it's surface can only be a rectangle (FluidSurfaceActor). This issue is quite popular and been discussed on the support forum. It's not a big deal when you know about it: you just find a way around or design your game considering this limitation. But for the first time it really makes you ask: "Why? It's such a small thing, it shouldn't be like that!". If the engine hadn't been awesome in the first place, these small issues woudn't bother much. I think it is in a human nature (or in my own nature? ): if something is really cool, I want it to be perfect. And it upsets when it's not like that. I was so moved, so I made a comic! (Firefox) How to "fix" that ugly Roboto font in developer.android.com documentation pages? So, I had to fix that in order to continue reading the documentation. It's basically this Roboto font that makes me sick. The easiest solution was to block fonts.googleapis.com at the system level, i.e. add 127.0.0.1 fonts.googleapis.com to C:\Windows\System32\drivers\etc\hosts file. That did work, the browser replaced missing Roboto with the default Arial (which is perfect). But I didn't want to totally disable Google Fonts API (in case if some webside uses it for actually cool looking font). Since I am using Firefox, I checked if there are addons that can filter HTTP requests using resular expressions or wildcards. Redirector addon didn't work: it seems to redirect only URLs you enter in the address bar. ... and enjoyed reading Arial. Still, it is very annoying when Google adds new "looks" and "features" without giving users an opportunity to say they hate it! Forgotten Lands: does it make (ad)Sense? 3K visitors on my Forgotten Lands page and not a single donation so far. I hate ads, but looks like it is the only reasonable way to get support for my project. Forgotten Lands texture pack for Minecraft has been released! Forgotten Lands is a 16x16 texture pack for Minecraft. - It does not require any mods to run. - Low resolution means it runs fast. - Brightly coloured and smooth. - Enhanced biomes: you can find autumn forests and even grow a frozen park in tundra. - Distinctively looking ore and clay. - Everything redesigned: terrain, mobs, items, interface. This is a brief tutorial on code obfuscation for Android apps using ProGuard tool supplied with Android SDK. I had a bug related with this and solved it, so I would like to tell people about it. Also please comment to the bug report thread if you find something or if you would like make a suggestion. Any feedback is highly appreciated. 1.0.3 update didn't work because of ProGuard code obfuscation. I totally do not understand why it worked on my device and nowhere else. In 1.0.3.2 I removed the obfuscation, so it should work fine now.